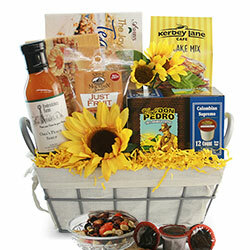 Looking for the perfect Coffee Gift Baskets? 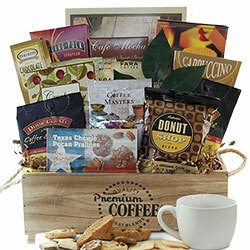 Our coffee gift baskets are filled with selections of the finest brews from popular brands such as Starbucks, Ghirardelli, Godiva, Wolfgang Puck, and Coffee Masters. 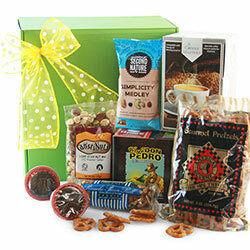 The tasty grinds and beans in our gift baskets are complemented by gourmet foods like biscotti, butter pretzels, Belgian biscuits, and other perfectly paired snacks. 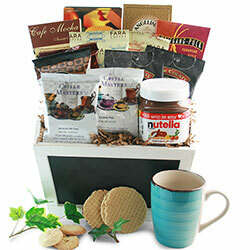 Send someone a basket full of Starbucks products, or even a Nutella-themed gift. 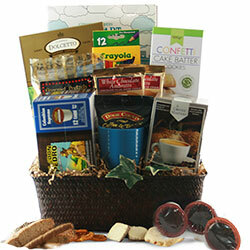 There are a variety of coffee gift basket options to please your coffee lover! 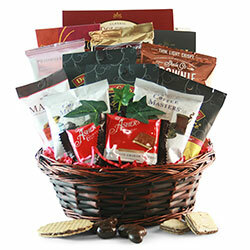 So go ahead, indulge your recipient! 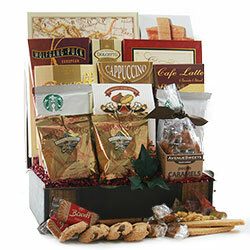 Send one of our popular Starbucks Gift Baskets or mix it up with a variety of specialty coffees. 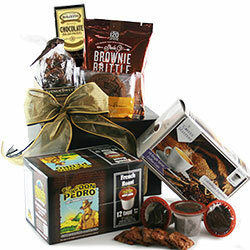 Our coffee gift baskets are sure to please your coffee lover! 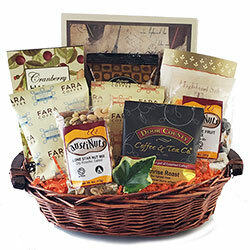 Can’t find exactly what you’re looking for here in our standard Coffee Gift Basket designs? 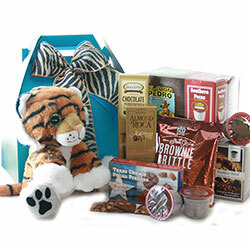 Create your own custom, personalized Coffee Gift Baskets using our Design It Yourself System: Custom Coffee Gift Baskets. 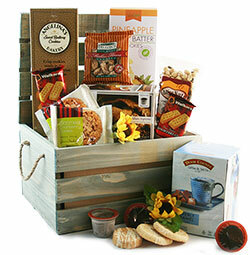 Not sure which basket is the best? There’s no wrong answer and each gift has been carefully curated by our in-house team to ensure it contains complementary flavors and products. 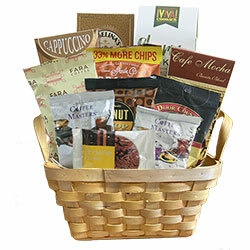 One of our most popular items in this category is the “Coffee Cravings Gift Basket”. 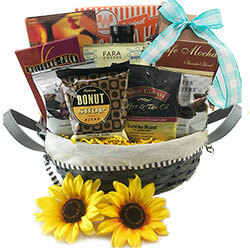 Ideal for people who embrace breakfast as the most important meal of the day, this basket includes several blends of Coffee City grounds, apple cinnamon pancake mix, maple syrup, chocolate biscotti, and more. 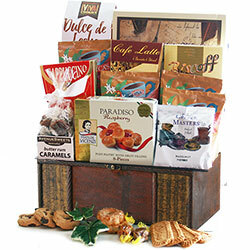 Another top choice is the “VIP Coffee Gift Basket”. 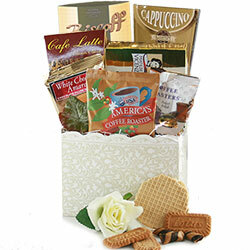 It offers an assortment of drinks, from Coffee City grounds and cappuccino mix to Ashby’s assorted tea collection. 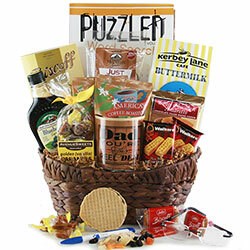 Gourmet foods such as Belgian biscuits, Italian puff pastries, and dulce de leche cookies complement the flavorful liquids in this gift basket. 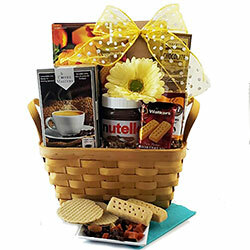 Another, more recently added selection, the Coffee & Nutella Coffee Gift Basket (available with Ground coffee or as a K-Cup basket) has already made it on the list of staff favorites and is sure invoke some smiles! Coffee is more than a morning pick-me-up; it’s a lifestyle. The quick cup of instant coffee before heading out the door has been replaced by savoring rich brews throughout the day. A flavorful breakfast blend before work, a fully-loaded cup of energy mid-afternoon, or soothing decaf before bed have all become rituals for modern-day families. 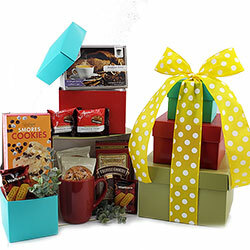 The “Daybreak K-Cup Coffee Gift Basket” might be perfect for early risers, while the sweet treats in the “Filled to the Brim Coffee Gift Basket” would be better for those who prefer to sip their mugs later in the day. 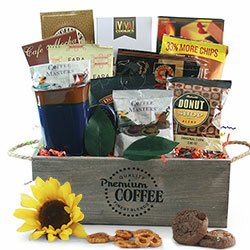 Whether your recipient likes an AM or PM cup of Joe, our coffee gift baskets will deliver the right dose.